Astana Expo City 2017 will be designed by Adrian Smith + Gordon Gill Architecture and will host the international expo. Image: ©Adrian Smith + Gordon Gill Architecture. The theme of the international event is ‘Future Energy’ and the buildings have been designed with sustainable features. Image: ©Adrian Smith + Gordon Gill Architecture. A sphere-shaped structure will be Kazakhstan’s pavilion during the expo. Image: ©Adrian Smith + Gordon Gill Architecture. The Expo City’s venues will be converted into usable spaces following the completion of the event. Image courtesy of A.O. Tercan. Astana Expo City will be constructed across 174ha and will include exhibition and cultural pavilions, retail and educational facilities along with other amenities. Image courtesy of EXPO-2017 ASTANA. Astana Expo City will be located south of Bayterek Tower and east of Nazarbayev University. The expo will run for three months, starting from 10 June 2017. ‘Future Energy’ will be the theme for the expo, which will focus on discovering innovative developments for the energy sector as well as promoting alternative energy sources and cleaner modes of transportation. The expo city will be developed in two phases, with phase one scheduled for completion in December 2016. Spread over 174ha, the expo city will include 118,620m² of exhibition and cultural pavilions, 686,000m² of residential development and 72,000m² of retail, socio-cultural, educational and civic spaces. It will also include a dedicated space for parking. The most significant feature of the expo city will be Kazakhstan’s sphere-shaped pavilion, which will be spread across 24,000m² in the middle of the city. Featuring a convertible outer layer, the pavilion is designed to control the entry of light and simultaneously reduce heat loss. The buildings will highlight the salient features of its site and culture, and include sustainable characteristics. Different buildings have been designed to reduce energy use, harvest additional energy, and improve comfort levels. The energy output of each building will be managed by means of multiple integrated systems. High-performance glazing will be featured in the buildings to capture more solar heat during the winter, and provide shade during the summer. The temperature within the buildings will be controlled by modulations, while energy piles will decrease the site’s energy demand. Renewable sources will be used to power the entire project. Innovative technologies will be employed to transform the buildings into power generators and the entire development into an energy storage hub. The first phase of the project, named the ‘Expo Mode’, will cover the design and construction related to the expo. The buildings constructed during this phase will include the central Kazakhstan, corporate and international pavilions, as well as hotels and retail and performance areas. The buildings will form a covered city to host the exhibition and welcome its visitors. Other facilities to be constructed in this phase include a conference centre, press centre, indoor city, houses, and hotels. A total of 28 buildings will be completed in phase one. The second phase of the development is the ‘Legacy Mode’ and will begin after the expo. It will focus on converting the buildings into an office and research park as part of a sustainable project. To attract international companies and entrepreneurs, expo-related infrastructure will be converted into an additional 700 residential units, as well as office, hotels, local markets, and civic and educational facilities. The master plan for the expo city is based on weather conditions, cultural context and land accessibility related to the project’s location. 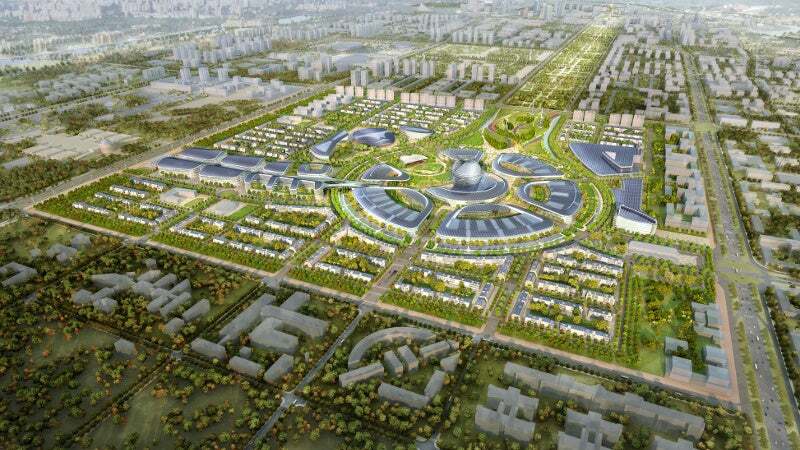 The covered city concept will connect important landmarks, including Nazarbayev University, the train station and the expo buildings. It has been designed to be pedestrian-friendly and accessible throughout the year. "The master plan for the expo city is based on weather conditions, cultural context and land accessibility related to the project’s location." A public park will also be part of the expo city, which will be connected to a larger park system. The master plan includes the construction of a smart energy grid, an integrated waste management system, and interseasonal underground and thermal energy storage areas. It has been designed to reduce total energy demand, water use and waste targets. A design-build contract for the project has been awarded to IT Engineering, a joint venture comprising Sembol Construction and Mabetex Group. The mechanical, electrical, plumbing, fire protection and smart grid low-voltage systems inside the buildings will be developed by PositivEnergy Practice. Integrated systems including solar panels, wind turbines, and ground-coupled heating and cooling technologies will be developed by PositivEnergy Practice, which will also design the smart grid infrastructure. Werner Sobek has been selected to design optimised structural systems for the project’s buildings. Home Safeguard Industries is the worlds’ leading manufacturer of aerosol smoke alarm testers. Introduced in 1979, 25S Smoke Check is the original and still the best product for testing smoke detectors. HSI has built a global presence serving the commercial fire alarm and security industries with our patented test tools and aerosols including Smoke Check Smoke Detector Tester, and NEW CoCheck, Heat Detector Tester and the Versa-Tools professional line of test equipment.